A wall commemorating the drowning of a Welsh village is being rebuilt after it was smashed by vandals. 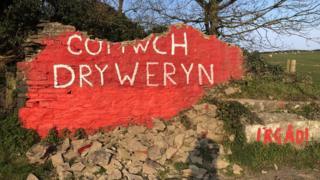 Parts of the "Cofiwch Dryweryn" - Remember Tryweryn - graffiti mural was turned to rubble in the attack near Aberystwyth. It comes just a day after activists repainted a section of the wall, after it was defaced. But volunteers stepped in after the damage was spotted overnight on Friday and began to repair the tribute. Ceredigion assembly member Elin Jones has described the action as "disgraceful". More than £1,000 has been raised via crowdfunding to secure the mural's future following this latest attack. It is the latest in a series of vandalism attacks on the graffiti, which marks the flooding of the Welsh speaking village of Capel Celyn near Bala in Gwynedd in 1965. The valley was dammed to create a reservoir to provide water to Liverpool, despite overwhelming opposition from Welsh MPs. The action was widely regarded as a turning point in the Welsh nationalist and language movements, witnessing Plaid Cymru securing its first MP in 1966. Dyfed-Powys Police said a spate of vandal attacks in recent weeks has caused "significant distress both locally and nationally". Insp Chris Fraser added: "I understand the strength of feeling about the Cofiwch Dryweryn memorial and that repeated damage to it has caused significant upset in the community. "I want to give reassurance that we are taking this matter seriously and will carry out a full investigation in to this mindless damage." Plaid Cymru has previously called for the Welsh Government to protect the site. But the government's historic monuments body Cadw said making the wall a listed structure would make future management of the site more difficult. A Cadw official added: "A more innovative solution is required and Llanrhystud Community Council will now consider ways of working with partners, including the National Trust, to devise a long term management plan for this site."